Disruption. It rhymes with destruction, followed by reconstruction. It is a radical change that shatters the status quo. No matter who we are and no matter where we live, we face a future that’s nothing like our past. Change is too small a word to describe the revolution we’re all living through. You can struggle with disruption or you can dance with it. Dancing is something that you do when you’re happy or having fun. It literally requires partnering with others in some kind of performance. You can’t force others to dance with you, you can only attract them. Over the past 25 years, superstar coach Mike Lipkin has studied and worked with thousands of disruptors around the world. In this thrilling guide to personal success, he shows us that the key to extraordinary success is to have so much fun that you become the source of other’s joy. This book is filled with mind-opening insights and examples that will inspire you to act like a disruptor – someone that creates the future one step at a time. There is an amazing breakthrough that is currently just beyond your reach. Mike Lipkin will help you grasp it. The people closest to you are counting on it. It’s time to dance. Mike Lipkin is the founder and CEO of Environics/Lipkin, one of Canada’s leading training and motivation companies. He is also a global coach that has worked with a million people in 43 countries. He lives in Toronto. 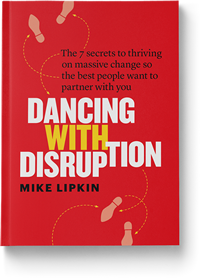 Dancing with Disruption is his seventh book.